Weeks after his parents disappear on a hike, engineer Adam Carson, 27, searches for answers. Then he discovers a secret web site and learns his mom and dad are time travelers stuck in the past. 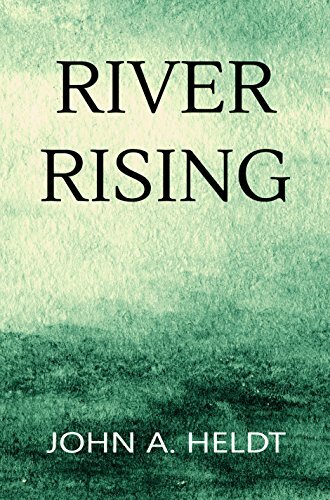 Armed with the information he needs to find them, Adam convinces his younger siblings to join him on a rescue mission to the 1880s. 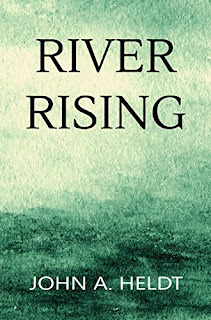 In RIVER RISING, the first novel in the Carson Chronicles series, five young adults find love, danger, and adventure as they experience America in the age of bustle dresses, gunslingers, and robber barons. I am a huge John A. Heldt fan. His time travel books are always fun and even educational. This was was no exception however I will start off by saying that the transition from Adam finding out his parents were time travelers to the decision for him and his siblings to set off on their own time traveling adventure isn't as believable as the rest of the book. Traveling past that (pun intended) the rest of the book is great and makes sense that it would play out the way it did. As the adventure begins the siblings have to make the transition from 2017 to 1889 and I had a good chuckle over the times that something modern slipped out when they were talking to their new friends. The rest of the story pulled me in quickly and I ended up zooming through the read. Each sibling has a story line of their own so the book switches back and forth between characters and I ended up growing to love them all. Again I learned about an event in history that I hadn't heard of before and once again I was intrigued enough to read of up the real life event. If I felt heartbroken for the book characters I can't even begin to imagine the emotions and pain that the real event brought on. Heldt captured it so perfectly that I could actually see it play out in my mind. Below is an image from Wikipedia of the real event which is exactly how I pictured it while reading. Overall this a great book for anyone who loves historical fiction with a time traveling twist.This was the first in the new Carson Chronicles series and the cliff hanger ending makes me look forward to book two.